It was a romance for the ages, but alas, Kyga (Tylie?) fans, Kylie Jenner and Tyga have ended their social media-happy, rather expensive relationship. And while we mourn for the love (and cars) lost between these two, let’s remember the good times too. From their early days as a top-secret couple (pre-legality) to Jenner, now 18, displaying Tyga’s framed mugshot in her living room, take a look back at these two’s wildest moments. While Tyga, now 25, was still together with baby mamma, Blac Chyna, he posed in this group shot with Kylie and Kendall Jenner, Chris Brown, and some friends. Just a couple of pals hanging out? The weekend before Tyga and Blac Chyna revealed they had split, the rapper threw Kylie an early 17th birthday party with guests Justin Bieber, Chris Brown, and The Game. "It was extravagant!" a source told Us Weekly at the time. "Tyga had two custom cakes made for her and he asked Justin Bieber to sing her &apos;Happy Birthday.&apos; And he had hats made with her photo on them." Coordinating costumes? Before they acknowledged they were even dating, Tyga and Kylie attended a Halloween party in 2014 as Chucky and the Bride of Chucky. Are you guys sure you’re not a couple? Giving thanks! Around Thanksgiving the pair served food to the homeless at the Los Angeles Mission and Anne Douglas Center&apos;s Thanksgiving Meal for the Homeless together. Kylie did not put her lengthy aqua hair extensions into a hair net…just sayin’. The dating rumors intensified shortly after Valentine’s Day when Tyga posted a selfie of the reality star via Instagram, writing, “Your beauty never goes unnoticed. One of the best/dopest person in my life.” Around the same time, Kim Kardashian’s husband, Kanye West, joked on The Breakfast Club: “I think [Tyga] got in early. I think he was smart." Permanent tribute? 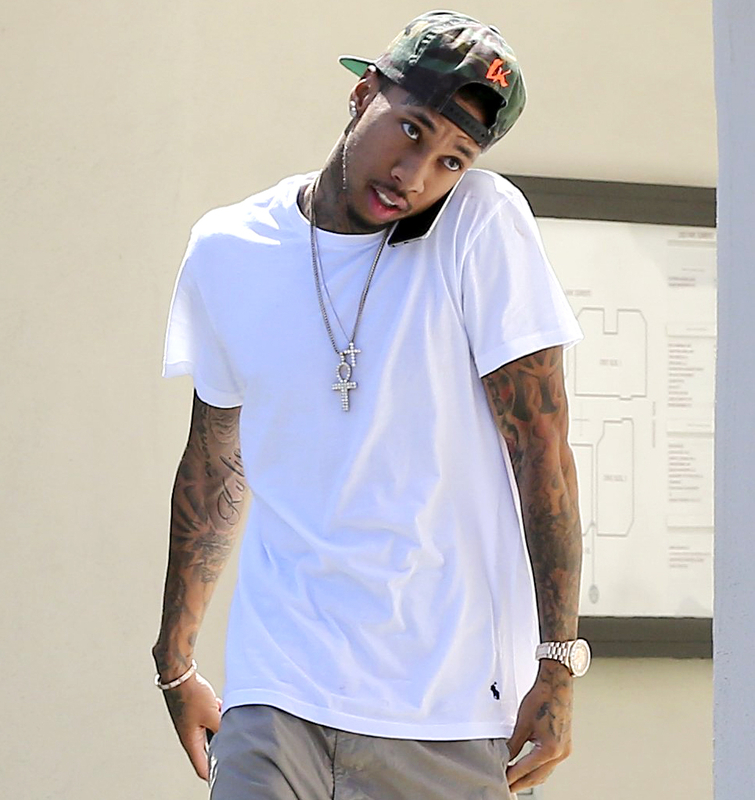 In April a fan photo surfaced of Tyga’s right arm, which sported a giant “Kylie” tattoo near his elbow. Kylie and Tyga went on a double date with her mom, Kris Jenner, and her boyfriend, Corey Gamble, at the Mail Online Yacht event in Cannes. The foursome posed on the carpet together, with Kyga in matching all-white ensembles as Kylie grabbed her crotch. Sigh, true love. Legal love. Finally, the moment had arrived when Kris’ youngest turned 18. Naturally, she went all out for her celebrations. But even more over the top than her blonde wig were her then-boyfriend’s extravagant gifts. After already giving her a red Mercedes that originally belonged to Blac Chyna, Tyga surprised Kylie with a $320,000 white Ferrari. Just a small token of his love? Right after her blowout bash, Kylie jetted off to Mexico to celebrate in style, err, rather cornrows. While finally able to show some PDA, Kylie frolicked on the beach in a series of racy bikinis, went Jet Skiing, and even tried flyboarding with her man. Things got kind of strange later in the month when Tyga accompanied the Kardashian-Jenner clan to St. Barts for their annual vacation, and sat in on a photo shoot Kylie was doing for a swimsuit line. As she flaunted her assets, he chomped on some Flaming Hot Cheetos. Totally normal, right? Later that month, they attended the MTV Video Music Awards together where West gave his bizarre Video Vanguard Award acceptance speech, in which he announced his intention to run for president in 2020. But Tyga didn’t seem concerned, throwing up a peace sign and sticking out his tongue Miley Cyrus-style while next to his lady love. Kylie in Tyga's music video for "Stimulated". At the very end of the month, Tyga released his PDA-filled music video for “Stimulated” featuring Kylie. Step aside, Kimye, they were Bound 2 each other! Engagement rumors abounded in the fall when Tyga called Kylie his “fiancee” in a cutesy Snapchat video. But the couple later denied they had made things official. When Kylie adopted yet another dog, she took to Instagram to show her man playing with the Merle English bulldog named Rolly. But this wasn’t any ordinary pup. Turns out little Rolly cost $50,000, because why not? Tyga's mugshot in Kylie's room. And Rolly wasn’t the only addition to Kylie’s home. While decorating her new $2.7 million mansion, Kylie added a framed picture of Tyga’s mugshot. She showed off the quirky accent in a video tour of her home on her brand-new website. 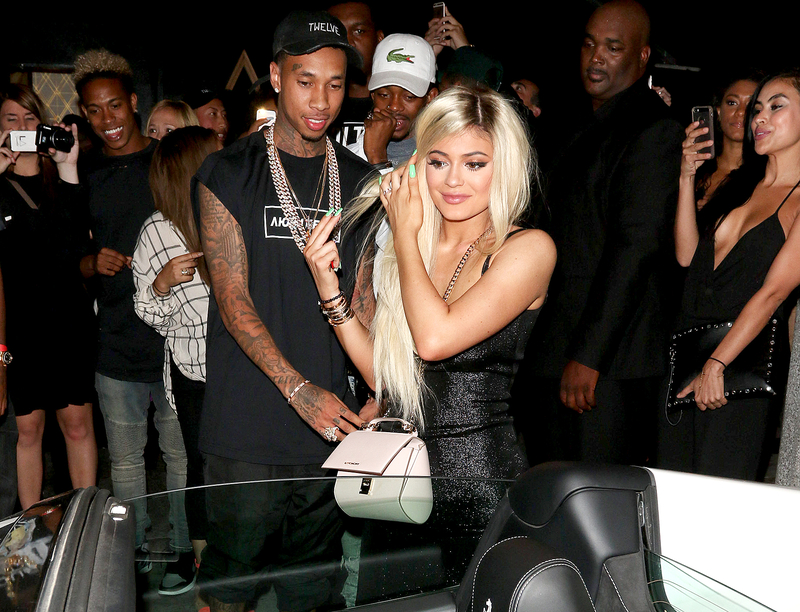 Tell Us: Are you surprised that Tyga and Kylie Jenner split?